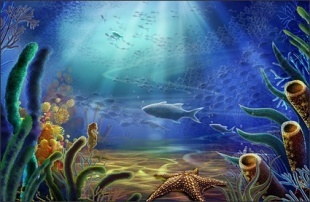 What is found in the ocean and is needed by every single one of our cells? What has our thyroid gland developed an ability to store? What plays a major role in our cells' ability to make their food and energy? The answer is what this page is all about. scroll down to the bottom of this page. Once upon a time people took iodine drops to stay healthy. Recuperating from illness at the seashore, where iodine vapor is found in the air, was a common practice. Some even say that the use of iodine to treat goiter in the early 1800s (a specific agent for a specific condition) marked the birth of Western medicine. Every single one of the body's trillions of cells contains and depends on iodine. If (as many scientists believe) life originated in the ocean, then our need for iodine may derive from this long-ago time. Iodine is an element found in seawater, in soil and air near the ocean, and in certain rocks and sediments, but it is not abundant. Modern-day farming and deforestation have depleted much of the earth's land of its naturally occurring iodine. Apart from eating fish, seaweed, and spending lots of time in or near the ocean, it is difficult for most people in the world to get enough iodine. Why is this the case? The presence in our daily lives of three other elements that are atomically structured much like iodine is affecting our body's ability to use the little iodine it has. Bromine, chlorine and fluorine (known as the halogens) are iodine's "dangerous cousins," and are increasingly being used in a huge variety of modern products. Bromine and fluorine are found in prescription drugs, fire-retardant fabrics and food-container linings. Bromine is sprayed on crops as a pesticide and is now a flour conditioner in bread and baked goods. Fluorides are in our toothpaste and drinking water (allegedly to prevent tooth decay), and are found in Teflon linings (pots and pans), soft drinks and fertilizers. Chlorine is in our household detergents, drinking water and swimming pools. Yet iodine can be used even more successfully in swimming pools, as shown by the 1963 Stanford University experiment in which swimmers by far preferred iodine over chlorine in the water. Iodine levels in Americans today are 50% lower than they were 40 years ago. Exposed as we are to the other halogens, our need for iodine uptake has become critical. Thyroid hormones are the building blocks of the entire hormone system, and the thyroid gland -- which can't function correctly without enough iodine -- regulates all of our metabolic activity. Hypothyroidism (low thyroid activity) is prevalent in many countries, and more than 70% of the world's population is affected by iodine-related disorders. Children who grow up in low-iodine regions tend to have lower IQs, as thyroid hormone (which can't be made without iodine), is crucial to brain development. Our glands need and store iodine, but it also concentrates in tissues of the stomach, the eye, intestines, skin, blood cells and the brain. Some glands even compete with the thyroid for iodine. Iodine has many anti-disease functions in our body: it is anti-bacterial, -viral and -parasitic, and induces apoptosis (regulated cell death) in our various organs, thus playing an important anti-cancer role. The increased presence of bromine, chlorine and fluorides in our bodies actually blocks iodine's use and impedes its beneficial biochemical effects. Bromine actually binds to our cells' iodine receptors, toxifying the thyroid and replacing its iodine stores. Goiter (enlargement/inflammation of the thyroid) is the result of a lack of iodine. This condition was once so prevalent in the land-locked Midwestern states that iodized salt was supplied as a way to prevent it. Yet today's RDA for iodine falls short of our body's real needs, as discussed by David Brownstein, MD in his acclaimed book, Iodine: Why You Need It, Why You Can't Live Without It. Dr. Brownstein was taught in medical school that doctors should not prescribe iodine. In clinical practice, he discovered its vital importance to human health. Doctors once prescribed iodine routinely, but as the pharmaceutical industry grew and began to market an ever-growing variety of new drugs to physicians, the value and utility of iodine became a relic of the past. In fact modern medicine has built a near phobia around iodine, believing that it will only upset the thyroid. Thyroid hormone stimulates the mitochondria in our cells to produce ATP (adenosine triphosphate), their fuel supply. ATP is the food molecule for our trillions of cells, and our bodies require iodine to produce it. Low ATP results in lagging overall energy, which we may find ourselves trying to boost with caffeine, candy or food. Iodine depletion may be the real cause of our low-energy feeling, but drinks, power bars and fast foods are big money-generating markets compared to iodine supplementation for only pennies a day. In addition, the toxic load of environmental pollution, preservative-laden food and chemical-laced drinking water in our present-day lives is creating oxidative stress in our bodies. Healthy metabolism depends on a proper exchange of protons and electrons in chemical reactions on the cellular level. A molecule acquiring electrons and protons undergoes reduction; a molecule releasing them undergoes oxidation. Complex organisms like humans and animals need more reduction than oxidation (thus the importance of anti-oxidants), as reduction makes more electrons available for energy production. The redox balance refers to the cells' electron uptake: With too much oxidation and not enough reduction, the cells lose electrons and therefore energy. Oxidative stress refers to too much oxidation, which results in lowered cellular energy. All this said, our cells need thyroid hormone to make their food; the thyroid needs iodine to make its hormones. In fact, thyroid hormones (T1, T2, T3 and T4) contain actual molecules of iodine, the numbers denoting how many iodine molecules are in each. What does iodine do to protect you from fallout? What kind of iodine products are there? The plume was predicted to be reach the West Coast on Saturday, March 19th. Seaweed snacks, noodles and extract sold like crazy, though you couldn't anyone interested a month ago. KI fell into short supply, and iodine vendors who still had stock jacked up their prices. What many people didn't realize was that although iodine-131 (an isotope released from nuclear reactors that are compromised) is radioactive, it has a short half-life and the levels expected to reach North America were not dangerous. But contradicting reports flew across the Internet. Here's an update from the EPA and another report from the Public Health Department in Mono County, CA, authored by Richard Johnson, MD, MPH and Linda Salcido, both public health officials. The predictions, it says, are based on computer models, a What If? situation. The mad fever that has gripped us all is just a psychological storm. 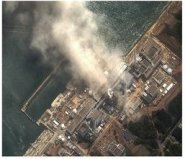 "We do know that some amounts of radiation have been released, as some containment vessels have been compromised. We do know that radioactive iodine has been released several hundred yards into the air and has settled back to the ground up to 20 yards away from the plants, where it will be absorbed into the soil, aided by the rain and snow. It has a half-life of 8 days, which means that 50% of it is no longer active after 8 days, and so on. Previous experience from the Nevada Test Site over many years and from the Chernobyl event show that only 10% of the radioactive iodine reaches the ground -- the rest decays quickly to xenon 131 which is stable and non-radioactive. ... In summary, Japan is experiencing a huge but localized industrial and environmental disaster, with a human disaster unfolding before our eyes. "There is no reason to buy KI pills. Besides, I have not found any in the Eastern Sierra. I do not have any, Public Health does not have any, and the pharmacies and health food stores are out or never had any. You can try eBay -- if you have $2500 in spare change lying around! KI has been distributed for many years to those living within 10 miles of the 104 nuclear power plants, including San Onofre and Diablo Canyon. But even if there was a catastrophic event at one of those locations, we would not be candidates for taking KI." Nascent iodine (see box, above right) is a bioavailable elemental form of iodine and a dietary supplement that is taken in the form of liquid drops. Note that iodide is different from iodine in that iodide is a compound (bonded) substance that must be broken down by the body into iodine by a process of oxidation. The thyroid performs this job with the help of hydrogen peroxide and thyroperoxidase. The idea behind using potassium iodide (KI) in the event of a nuclear disaster is that if the thyroid has enough "good" (non-radioactive) iodine it will not take up the radioactive iodine released by such an event. From the CDC's website: "Following a radiological or nuclear event, radioactive iodine may be released into the air and then be breathed into the lungs. Radioactive iodine may also contaminate the local food supply and get into the body through food or through drink. ... In the case of internal contamination with radioactive iodine, the thyroid gland quickly absorbs this chemical. Radioactive iodine absorbed by the thyroid can then injure the gland. Because non-radioactive KI acts to block radioactive iodine from being taken into the thyroid gland, it can help protect this gland from injury." The point being made is that potassium iodide can help the thyroid, but it does not protect the body's other glands and tissues from radiation damage. It is not a panacea or cure-all. Because the thyroid is the body's chief hormonal/metabolic regulator, protecting it is a good idea. Iodide is converted by the thyroid into iodine and used to make thyroid hormone, which is needed by every cell in the body (see posts above). The body's reproductive glands (breasts, ovaries, prostate) also store and need iodine. These glands will compete with the thyroid for available iodine, so it's important to supply the body with enough. An additional function of iodine: One of its beneficial regulatory tasks in the body is inducing apoptosis (programmed cell death), particularly in the iodine-dependent tissues and glands. We know that cancer cells do not reproduce like normal cells (they continue to rapidly divide), and high radiation exposure is known to cause cancer. By promoting apoptosis, iodine helps the body to keep its cells in check. Note: If you decide to try iodine supplementation, be sure to stick with the recommended guidelines for the compound (iodide) and elemental (nascent) forms, which are quite different. Remember that nascent iodine is immediately available to the body; iodide is not. Iodine is a trace element, meaning the body needs very small amounts. The nascent form is not the same as the compound (KI) form. See manufacturer's recommendation for nascent-iodine dosage. Order nascent iodine here. At Last -- Shark Deterrent Wetsuit!